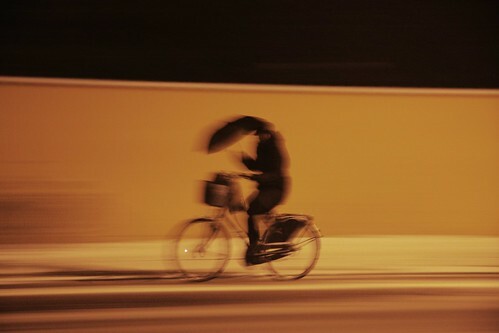 A well-dressed Copenhagener heading out for a Saturday night in a snowstorm. Shiny latex tights - all the rage - and smashing heels complete the cyclotastic ensemble. 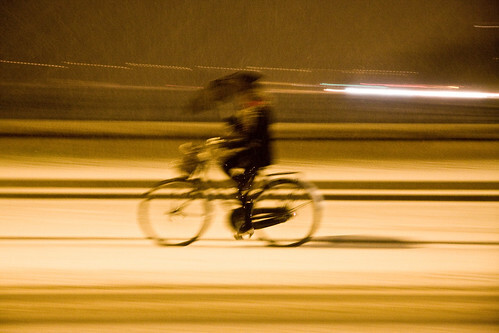 Another snowstorm brolley shot, this one more of an emotion, a dream. An elegant umbrella-carrying figure appearing out of the snow. And disappearing again. but newer the less, carry on, because I do! all materials are bike-friendly materials, per.